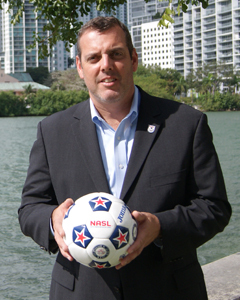 New NASL Commissioner, Bill Peterson. The North American Soccer League announced today that Bill Peterson will take over as the league’s new commissioner. Peterson took control of the league on November 19 after a 45-day search which was set in motion after former league commissioner David Downs announced his early resignation on October 5th, something the league knew about well before his formal announcement to the public. The NASL held off announcing Peterson’s appointment until today because of the Thanksgiving holiday. Peterson has been involved in sports from a young age. He grew up playing American football and was even a free agent linebacker in 1987 with the Los Angeles Raiders. He started working in the business side of sports when he was just 27 years old, going to work for the NFL Europe League, and spent 10 years living abroad. He was Football Operations Director for the Frankfurt Galaxy, General Manager of the Amsterdam Admirals, Director of Football Development for the league, Managing Director of NFL Europe and eventually become the President of the league. Why might a former NFL player and president of NFL Europe be a good choice to run the 2-year-old North American Soccer League? A closer look at Peterson’s experiences clarifies why executives from the NASL fingered the former American football man for the job. Peterson lived in Holland, England and Germany and says he has had many of those sort of moments in the 10 years he lived there, being at the right places at some key moments. While living in Frankfurt he watched Eintracht win the Bundesliga 2 title and says he got to watch an entire city light up with passion. He was also in Amsterdam in 1995 when Ajax won the Champions League. He has also seen countless European matches of significance be it Champions League finals or derbies like Arsenal vs. Chelsea. “As a sportsman you see the level they are playing at and immediately recognize that these are world class athletes doing things that the average humans could never do,” Peterson said. Peterson returned home and went to work for AEG for 6 years. He sat on the board of the Chicago Fire and helped them through their quest to find a stadium. He did the same thing while working with the Los Angeles Galaxy and became managing director of the Home Depot Center. In his early years with AEG, he sat on Major League Soccer’s Board of Governors, Finance Committee and Competition Committee. He then spent 4 years with Centerplate, a publicly held corporation where he was Executive Vice President of Operations. Centerplate is one of the largest hospitality companies in the world, with 250 North American sports, entertainment and convention venues. Peterson oversaw 140 facilities and managed 28,000 employees. The corporation generated nearly $850,000,000 in revenues including: Culinary, Merchandise Sales, Restaurants, Retail Operations, Client Relations, and Facility Management/Operations. In one of Peterson’s more recent ventures he finished a not-so-successful stint with the United Football League which has since folded. Peterson has a lawsuit against the league for unpaid wages. He’s reluctant to talk about the situation but says he has learned lessons along the way at each of his former positions which he believes has readied him for the job of NASL Commissioner. In particular he points to his job with AEG and the NFL Europe League as the two most important. “In the early days, there was a high level of commitment and passion with some great leadership at AEG, which helped build the company,” explained Peterson. “As I sit here today, I am now comfortable with almost every aspect of professional sports and if there is something that I haven’t seen, I have a good group of people around me and I know how to work with a group to make good decisions,” said Peterson. Peterson states that his work ethic combined with perseverance may be some of his best attributes. He enjoys pushing things hard and watching organizations grow and develop with a determination to succeed. He says in the short term he wants to continue assisting the current NASL teams in building relevance and becoming professional sports entities in their cities that create excitement and passion. Long term, he not only wants to grow the league but wants to ensure the NASL stays strong and successful and that they are helping to grow the game in North America. Peterson finished by emphasizing the importance of the fans of the NASL teams explaining that the league needs to service its supporters. The 48-year-old Peterson is the father of two daughters and resides in Ponte Vedra Beach, Florida. He is an avid cyclist and is currently the Chairman of the Board of USA Cycling and a member of the Trustee board of USPRO Cycling, both are volunteer positions.